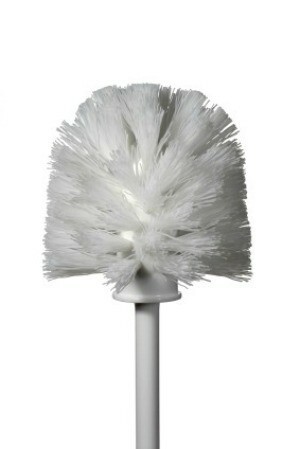 It is very frustrating when you are cleaning your toilet and the brush head becomes stuck in the toilet. This is a guide about the toilet brush head stuck in toilet. 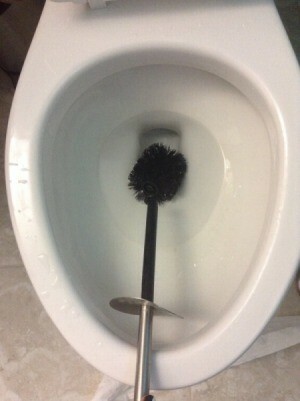 A toilet cleaning brush was pushed down deep in the toilet to push the water down, and the handle broke and the brush is stuck all the way down in the toilet, how do I get the brush out and unclog the toilet? Personally I would call a plummer. If you don't want to do that, get a set of huge pliers and get hold of it and pull it out. I think you need to call a plumber. We got a plastic toilet paper holder stuck in our toilet when it was accidentally flushed, it got stuck crossways and couldn't be reached from either end. We called a plumber thinking we'd probably have to get a new toilet all because of that stupid plastic holder. Well, this plumber took the toilet out onto our lawn, and using a welding torch (can't remember which end of the toilet he used it on, sorry), was able to melt that holder enough that it changed shape and fell out of the toilet. (And since the toilet is porcelain, the heat from that torch didn't hurt it any; only some slight scorch marks which cleaned right up.) Good luck! Just wanted to say. I have today had the exact same problem. After putting hand down the toilet with some bleach down, I have wiggled and maneuvered the brush head I got it to the end of the bend n when I couldnt move it any further, I poured hot water from the tap n left it it a while n got a pair of pliers n pulled like mad n sure enough it came out. Try it n if it works for people. Great.. Wot a challenge. Ok so my toilet brush was stuck in my toilet and I was freaking out. I pulled and pulled as hard as i could and i ended up breaking the handle by accident which actually helped me. It was alot easier to get just the brush out so I took a hold of that and yanked it out! Its broken but it's better than a broken toilet. Dont call a plumber! Save your money. I listened to this guy and the blow torch person. What I came up with was emptying all water from the toilet and then pouring boiling water on the stuck part. Popped right out. Thanks, guys!!! I love the Internet. I have had a plumber come out and taken the toilet off the floor. Several people have tried to get it out. The toilet base has several bends in it which makes it more difficult. Can anyone help as it seems I will have to get a new toilet? That will be a problem with the tiles on the floor and the wall. We had the same thing happen. Removed the toilet and tried for several days to get the broken piece of the brush out to no avail. Had to purchase and install a new toilet. Did you try a snake? try cutting off the bristles it will make it smaller. Might work. The toilet brush stuck in the toilet and I tried to take it out, but couldn't reach. Any way I can take it out by myself, from the toilet bowl, without a plumber? Have you tried grabbing it with a long handled pair of pliers? Is it too far to use something like that to grab it? I have the sponge end of a toilet bowl cleaner brush stuck in my toilet. How can I unclog my toilet?